Quite a few of you have some great videos on YouTube. But how can you get those seen by a larger audience to entice more customers to come into your store? #1 It's all about the title! Be sure to word your title carefully as this Marketing Think article points out. Be sure to highlight the main topic as the first words instead of the last as Google will rank your video higher in searches. Also, many people also use the word video when searching for a video so don't be afraid to title your video: Domenica Pizza Video instead of Pizza made by Domenica. #2 Link your videos to your blog or if you don't have a blog, be sure to embed the videos into your pizzeria's website. 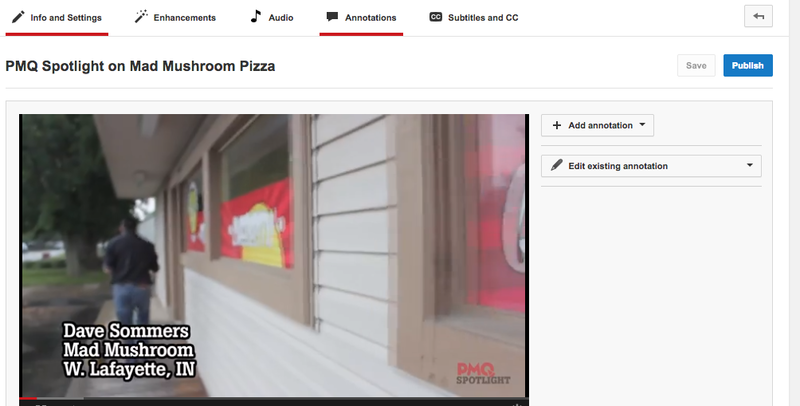 PMQ makes sure that every video we post on YouTube is also easily found on pmq.com. Above is the video we recently hosted in the November PMQ issue about mobile wood fired oven pizzerias and Mama Napoli Pizza in Las Vegas. Another great example is Hungry Howie's who is great about putting out a constant stream of video. The newest is always embedded directly onto the front of their website, http://www.hungryhowies.com/ which allows for casual browsers of their website to discover the hidden gems of their often hilarious or touching videos. #3 Utilize the description area on your YouTube page. Don't just describe your company but link your social media and include your website address. #4 Call to actions and sharing other videos. Annotations on YouTube are extremely helpful as the annotation can be placed at any point in your video to remind people to either visit your website, enter into a contest or just to watch another video. Utilize the annotation area under your video edit to add an annotation wherever you'd like in your video. Be sure to include at least six tags under each video that tie to the subject. Also, be sure to set your settings to public, add the video to a playlist and also allow it to share in google+ and Twitter when you set it to public. You can then also share your video on any other social media your pizzeria uses to increase view count. Even better is when others share your videos!